Available in a range of classic and modern wood styles, Airsprung Single Beds are designed to fit into any bedroom environment seamlessly, from a child's room to a spare bedroom. Airsprung has been renowned manufacturer of high-quality beds and mattresses for over 130 years. When you purchase an Airsprung product, you're receiving furniture developed with over a century of experience and expertise to ensure you get the best night's sleep possible in a bed designed to last. At Bedz 'R' Us, we not only offer some of the best-rated service in the business, we also care about our customers. We want to find the right bed for you, and get it to you as quickly as possible with one-day shipping for many of our products. 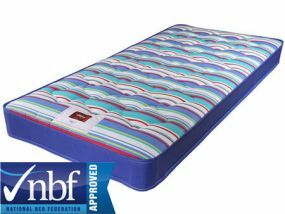 We also sell high-quality mattresses to ensure the ultimate in relaxing rest and comfort no matter what your requirements. We consider ourselves bed specialists, and we're sure after purchasing one of our beds you'll consider us experts too.